When you have everything in life you don’t have time to think for yourself. When you don’t have anything to do those little things that you had long forgotten just resurfaces. I am kind of discontented with the way my life is stirring these days. But I am getting in touch little things that I always loved…And kind of enjoying this journey towards “soul realization”. Walking down the street today I caught a glimpse of the Champa(Plumeria) tree in front of my grandmother’s house. In an instance the memories of my childhood seemed to engulf me. As a child I had always loved playing under this tree, I would collect the dried up flowers and keep feeling its fragrance. It had kind of a strong scent but …I had fallen in love with it the moment I had realized about its existence. So essentially I loved it…But with time I had basically forgotten about my fascination for these flowers or may be getting a degree,the dream of making it big , work had enslaved me ! Millions of time I would have passed by the tree but never had been conscious of its presence in all these years. Today One sight was enough to bring back reminiscences of bruised knees, the carefree days, and the giggling me…I used to be so happy those days! A flower had so much to speak …so many memories to convey to me …Even for an instance it made me happy and I am very happy because I was reintroduced to a part of me today. 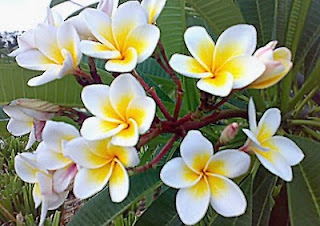 Time will again move on I will start working have a family …and this charm of Plumeria will be again wrapped up with other thoughts but …I am content and gratified to the lovely Plumeria...For the calmness that it got to me today even though it was for a brief moment.